You can import Harmony pencil presets that you previously exported. From the Brush menu , select Import Brushes. In the browser window that appears, navigate to and select the .xml file. 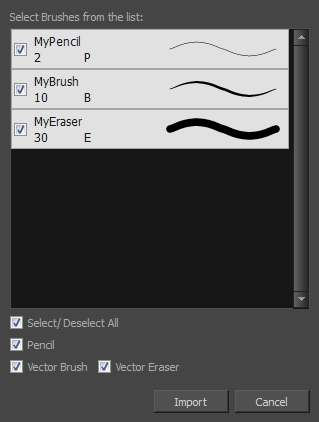 In the Import Brushes dialog box, select the brushes brushes and erasers you want to import. You can also import pencils at the same time. The imported brush, eraser and pencil styles will appear in the presets library. You can reuse any of the imported tips to create other brush, eraser and pencil style presets.